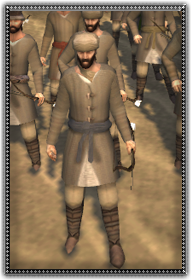 These are common people pressed into fighting for their country, they are equiped with short bows and are able to use them efficently, if not always effectively. This unit cannot be relied upon for close quarters fighting, preferring to run instead. However these men may be the straw that breaks an enemy charge and sends them fleeing. These men are adequate at what they do but will always have one eye on returning home to their professions and families.